Just another daybreak at the zoo--the animals bored and motionless in their confines, a snoozing keeper sagging in his chair outside his guardhouse--but a with-it walrus in his pool is eying a serendipitously open gate. In the turn of a page the walrus is out of there, and the rotund mustachioed guard, clutching a ineffectually small dog-catcher-type net, is in hot pursuit. Walrus, of course, is right there, motionlessly mimicking the entrance fountain's other stone mermaid, invisible to the hapless keeper. The search goes on with the next turn of a page, where the walrus is invisible in plain sight, one of a row of gray-suited, black-derbied coffee drinkers seated on identical stools at the counter of mid-century diner. The keeper looks straight past him without recognition, while Walrus favors us with a gleefully conspiratorial look. With each new page the walrus blends into the busy city scene--a line of identical hard-hatted bricklayers, one of three frou-froued mannikins in a millinery shop, a red-hatted firefighter bravely holding a spouting fire hose aimed at a conflagration, a high-kicking chorine in a musical hall revue, and one of a row of landscape painters at their easels in the park. In each scene our hero, so obviously a walrus, yet manages to blend in with the cookie-cutter forms of the people engage in daily activities in a static but vital cityscape. The befuddled zookeeper grows more exasperated, and the walrus plainly enjoys his game of cat and mouse--until, hiding amidst a line of red-capped high divers, he just has to stand out from the crowd with an amazing double flip dive--and his cover is blown, just as the zookeeper suddenly sees, not just his quarry, but the possibilities of his talented charge. The final spread shows Walrus, back where he belongs, but with a high diving pool where his finally gets the attention he deserves. 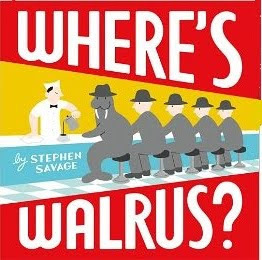 Steven Savage's new Where's Walrus? (Scholastic, 2011) appears to be a simple picture puzzle book for small children, and it is. But its simple lines and flat color belie the retro sophistication of its Adobe Illustrator computerized art. Playfully spoofing the Where's Waldo? premise in his skillful manipulation of color, form, and line, Savage achieves just the right trompe l'oeil effect for his target audience with a touch of humor to please any age reader. A wordless picture book which is the last word. Kirkus Reviews says "Refreshing, captivating, elegant and witty!"